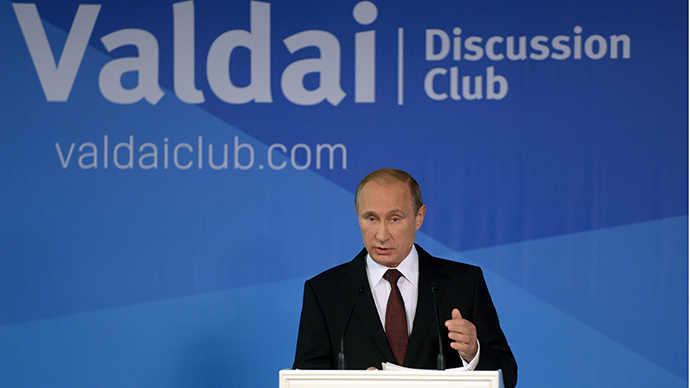 At this year’s meeting of the Valdai Club, where prominent Russian officials come together with international experts to discuss the state of the country, President Vladimir Putin seemed to make a startling assertion—that Russia would not use nuclear weapons first in a conflict. While the announcement could have marked an opportunity for cooperation to address nuclear tensions, the Trump administration quickly took a step back in announcing the United States will withdraw from the Intermediate-Range Nuclear Forces (INF) Treaty. This decision to destroy a landmark arms control achievement is dangerous and destructive – the only way to resolve tensions between the U.S. and Russia is through cooperation. Just last week, Vladimir Putin alluded that Russia would not use nuclear weapons first in a conflict. Press Secretary Dmitri Peskov stated, “…at a doctrinal level Russia does not reserve the right to a preventative strike. That is, this right is not fixed in our doctrine. We do not consider ourselves entitled to conduct a first strike.” He also stated that Russia will consider the use of nuclear weapons when “the very existence of [the] state is under threat” – the same words used in 2010. While this wasn’t quite a declaration of a No First Use policy, it shows a willingness on the part of Russia to address tensions with the United States over the possibility of a nuclear exchange. at a doctrinal level Russia does not reserve the right to a preventative strike. That is, this right is not fixed in our doctrine. We do not consider ourselves entitled to conduct a first strike. This recent declaration by Putin could have served as an opening for constructive dialogue with Russia on ratcheting down tensions, and perhaps even working toward unambiguous No First Use declarations for both countries. Yet, instead of welcoming this news as a step forward in a cooperative effort to reduce nuclear risk, the Trump administration announced shortly after that the U.S. would withdraw from the INF Treaty, a landmark arms control achievement of the 1980s, citing claims that Russia is violating the treaty and the fact that China is not a party. The decision has been met with opposition across the political spectrum—from nearly everyone other than John Bolton, the president’s national security advisor, who has long held that the U.S. should leave the treaty. Not only is the decision to exit the [INF] treaty destructive, it also abandons an important foundation of the relationship between the two largest nuclear powers without plans to replace it. While any nuclear-armed state deciding to adopt a no-first-use policy is a step forward on nuclear arms control, the character and strength of the U.S.-Russia relationship is a particularly important factor in the overall state of nuclear arms control simply because these two countries possess the vast majority of the world’s nuclear weapons. Not only is the decision to exit the treaty destructive, it also abandons an important foundation of the relationship between the two largest nuclear powers without plans to replace it. Both Russia and China have already released statements warning that the U.S. decision to abandon the treaty will have negative consequences. The Russian statement made reference to the need to “restore military balance,” and Putin has stated that European countries that allow U.S. missiles to be stationed on their territory will be at risk of Russian retaliatory strikes. There’s no sign that the U.S. attempted to constructively address Russian violations before making the decision to withdraw—a destabilizing decision driven by a disdain for cooperation and a clumsy attempt to assert U.S. dominance among nuclear states. But cooperation — not pouring even more precious resources into a vast, expensive and ever-more technologically advanced nuclear arsenal — is key to ensuring U.S. security and avoiding a nuclear arms race that threatens the whole world.